Duodenal Atresia is a congenital abnormality of the first part of the small bowel. In healthy infants, the intestine is continuous from the beginning to end. In duodenal atresia, a portion of the duodenum is blocked. The result is an enlargement of the upstream duodenum, and no passage of food or air distally. The newborn is typically unable to digest food and may vomit green bile (bilious emesis). 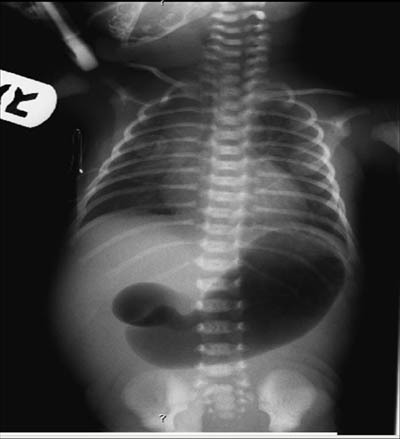 The diagnosis can usually be made by a plain x-ray showing a gas-filled stomach and enlarged (dilated) duodenum, but no distal air in the GI tract This is often called a “double bubble sign.” The presence of distal air is concerning for intestinal volvulus and mandates an upper GI to exclude malrotation. If no air is seen distally, the diagnosis is usually possible based on the plain X-ray. Treatment involves surgical bypass of the blocked duodenum, called “duodeno-duodenosotomy.” Annular pancreas is a variant of duodenal atresia which is treated in the exact same fashion. 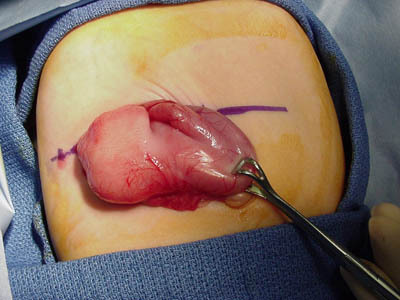 The repair can be done through a variety of techniques including right upper abdominal open incision, incision through the umbilicus, or laparosopic repair. The choice of technique is individualized to the patient and treating surgeon. Note the massively dilated duodenum and pylorus. Also note Vein of Mayo.